Click Here - To see how Camden County evolved each decade - includes all the known towns and villages. Click Here - To view the significant Education events for Camden County since the county was formed. Click Here to go to the official website of the Camden County government. Click Here to learn more about the known airports in Camden County. The Dismal Swamp Canal is living history. Connecting the Chesapeake Bay in Virginia via the Elizabeth River and the Albemarle Sound in North Carolina via the Pasquotank River , this is the oldest continually operating man-made canal in the United States. Its inclusion into the National Register of Historic Places and its designation as a National Civil Engineering Landmark are honors worthy of its colorful past. Both George Washington and Governor Patrick Henry of Virginia felt that canals were the easiest answer for an efficient means of internal transportation. 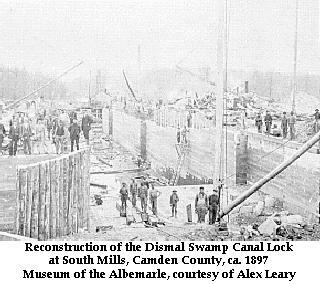 In 1784, the Dismal Swamp Canal Company was created. Digging began in 1793 and progressed slowly since the canal had to be dug completely by hand. Most of the labor was done by slaves hired from nearby land owners. It took approximately twelve years of back-breaking construction under highly unfavorable conditions to complete the 22-mile long waterway. By 1805, flat-bottomed vessels could be admitted into the canal, where tolls were charged to allay the continual expense of improvements and maintenance. By 1820, the Canal was recognized as an important part of commercial traffic between Virginia and North Carolina. In 1829, improvements to the waterway made it possible to accommodate deeper drafts. The 1860s and the onset of the American Civil War put the canal in an important strategic position for Union and Confederate forces. Wartime activity, however, left the canal in a terrible state of repair. The repairs and maintenance needed by the canal made travel difficult. A new era for the canal came in 1892 when the Lake Drummond Canal and Water Company launched rehabilitation efforts, which actually commenced in 1896. Once again, a steady stream of vessels carrying lumber, shingles, farm products, and passengers made the canal a bustling interstate thoroughfare. With the twentieth century, however, improvements in modes of transportation meant another downturn for the canal. By the 1920s, commercial traffic had subsided except for passenger vessels. In 1929, it was sold to the federal government for $500,000 and the U.S. Army Corps of Engineers operates and maintains it. Today, visitors and navigators travel where famous explorers and presidents have stood and literary greats have been inspired for over two hundred years. For example, astride the two states' border is the site where the infamous "Halfway House" hotel was built in the late 1820s. The hotel was a popular spot for marriages, duels, and those escaping the law. Since the hotel was on the state line, these last simply walked to the other side of the hotel to avoid being captured in either state. It is also said that Edgar Ellen Poe wrote "The Raven" during one of his stays at the hotel. Boats today follow the course of James Adams' Floating Theatre, where Edna Ferber got the idea to write the novel "Showboat," upon which the famous musical is based. Camden County was settled around 1650 or perhaps even earlier, the first residents drifting down from Virginia and establishing themselves on both sides of the Pasquotank River. The first major settlements developed around four creeks - Raymonds, Sawyers, Arenuse, and Joys. Dense undergrowth and swampy bottomlands made passable roads impossible; therefore, travel was mainly accomplished through the waterways. When Camden County was still part of Pasquotank County, a ferry was used to cross the Pasquotank River. During the Revolutionary War, a charter was granted to Lemuel Sawyer, Jr., to operate a ferry from a point near Camden Court House, where the river was only about two hundred yards wide. This ferry continued to operate until around 1911, when a bridge was constructed across the river. Since some of the early settlers came from localities in England where watermills were in operation, this method of grinding grain was attempted here. Because the streams were sluggish, the mills were not very efficient. Much more satisfactory were the windmills located on bluffs along the banks of the broad Pasquotank River. On May 9, 1777, Camden County separated from Pasquotank County and was named in honor of Charles Pratt, 1st Earl of Camden, England, as a token of gratitude because of his vigorous defense of the colonists in their complaints against the mother country. The new county was too busy with the Revolution to build a court house until 1782. During the American Revolution, Camden County furnished more soldiers to the cause of freedom than any other northeastern county ... 416 officers and men. Brigadier General Isaac Gregory was wounded and his horse shot from under him at the battle of Camden in South Carolina, but he recovered from his serious wounds. His services to his state did not end with the war. He was elected once to the House of Commons and re-elected successively to the State Senate for the next eight years. At the beginning of the war, the task of organizing and assembling troops of the continental army in eastern North Carolina was assigned to Colonel Gideon Lamb, who also saw much active service around Brandywine and Germantown. His son, Abner, a lieutenant, was wounded at the battle of Eutaw Springs in South Carolina. Colonel Selby Harney served gallantly throughout the war and was severely wounded at the siege of Charlestown. And Captain John Forbes, leading a company of Camden men, was killed at the Battle of Guilford Court House in 1781. Click Here to learn about all of the known officers and men who served in the Camden County Regiment of Militia during the American Revolution. All names in "blue/underscore" can be clicked on for additional information. Other distinguished men of this period were Colonel Peter Dauge, Joseph Jones, Colonel Dempsey Burgess, and the Rev. Henry Abbott. Colonel Dauge performed valuable service in assembling supplies for the colonial troops. Jones, Abbott, and Burgess were influential figures in the state legislature during the Revolution. Colonel Burgess and his brother-in-law, Lemuel Sawyer, have the distinction of being the only Camden natives serving as representatives in the U.S. Congress. Colonel Burgess is also remembered locally because he donated the site on which historic Shiloh Baptist Church now stands. In 1790, Isaac Gregory was appointed by President George Washington to be the first collector of customs for the Port of Camden or "Plank Bridge." This port of entry was on Sawyer's Creek in the Camden community and was a port of considerable maritime activity, bringing commercial benefits to the entire community. Joseph Jones made an attempt to establish a town here called Jonesboro. Wharves and warehouses dotted the banks of the creek to Murden's Landing on the Pasquotank River. However, due to the shallow creek and ships of heavier tonnage being built, the once flourishing trade vanished. The port of entry was moved to Elizabeth City in 1830. The Dismal Swamp Canal was built in the northern end of the county between the years 1793 and 1805. Dirt removed for the canal was thrown up to form a bed for a toll road which quickly became the route for a stagecoach line between Norfolk and Elizabeth City. U.S. Highway 17, the original Ocean Highway, now utilizes this roadbed. Building of the canal brought economic benefits to Camden and South Mills, where mills were erected at one of the locks. Seven men in Camden invested in the Canal Company, buying a total of twelve shares. On April 19, 1862, a Civil War battle called the Battle of Sawyer's Lane, also known as the Battle of South Mills, was fought near South Mills. Here, Confederate troops fought Union troops attempting to blow up the Dismal Swamp Canal Locks. After a brisk battle, the Federal troops withdrew. 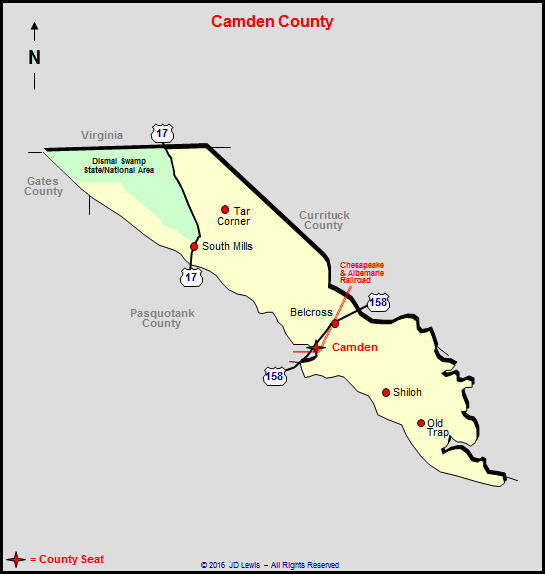 Click Here to view / download eight road maps of Camden County.